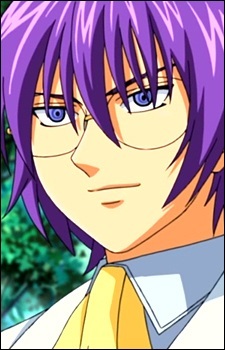 Asamiya Ryuuto was the former leader of Ragnarok and childhood friend and rival of Kenichi and is described as one of the main antagonists of the Ragnarok Saga. After his defeat at the hands of Kenichi, he joins Yomi and is Ogata Isshinsai's disciple. Ryuuto is a fair-skinned boy who is near-sighted. He wears round frameless glasses, and a white suit with a light yellow cravat. His purple hair, formerly a bowl cut from his childhood, has grown into a mass of strands. Though very short and scrawny as a young child, he has grown fairly tall and developed a well-muscled built. After suffering the recoil of his Seidou Goui, Ryuuto's hair turns grey and eventually grows to shoulder length, the sclera of his right eye turns black, and his legs have lost mobility, confining the former First Fist of Ragnarok to a wheelchair. He now wears a light blue hoodie with jeans. A six year-old Ryuuto was said by Kenichi to be the only kid who was nicer than he was, and also a kid who had a few clever perks. However, the young Ryuuto was not above taking advantage of his friend, giving him the cat badge that he got from the vending machine out of dislike for the badge (though according to himself, Kenichi really wanted the badge). Upon seeing how cool the Yin Yang badge that Kenichi traded for Miu was, Ryuuto demanded the badge, but was refused by Kenichi, and later fought Kenichi for the badge and lost. After Kenichi moved out of the neighborhood, Ryuuto demonstrates obsession by spending money to get the same Yin Yang badge from the machine again, only to realize that what he wanted wasn't the badge, but the victory that came with it, and from then on became obsessed with victory. As Ryuuto grows older, he trains in Karate, Pankration, and Boxing, getting disqualified from a match for attacking a downed opponent. He goes for a stroll in the cold, wondering how he could have lost when his opponent was the one who was knocked down, and sees Ogata defeat two armed opponents, prompting him to become Ogata's disciple. Ryuuto has no qualms about morality, and seeks only strength as he grows older. This extends to his life in Ragnarok, where he knocks out Berserker for associating with the enemy after the latter's loss to Hermit. His former friendship to Kenichi has turned sour, shown after he defeats Kenichi, when he bends his own Yin Yang badge and gives it to Kenichi as a loser's gift. Their friendship seems to be revived later on as Ryuuto gives back Kenichi's Yin Yang badge after his defeat and during the D of D tournament, when a wheelchair-bound Ryuuto defeats Kanou Shou's bodyguards sent to prevent Kenichi from reaching Shou. He is also oblivious of Rimi's love for him, though he does show he cares for her and appreciates when she tries to help him push his wheelchair.